into one single I/O module of the WAGO-I/O-SYSTEM 750 that will be shown at the PROFIBUS UK Conference in June. Just 24 mm wide but with guaranteed safety: The 750-663 for PROFIsafe applications is used when safety of personnel is called for in hazardous Zones 0 and 1. This 4-channel digital module is installed in the WAGO-I/O-SYSTEM 750 together with the classic automation components in Zone 2. The four intrinsically safe inputs with functional safety can be used for safety functions up to “SIL 3” and “Cat. 4 PLe.” Despite the combined features, the requirements for users during commissioning remain the same: The safety interface for the new 4-channel digital input module is identical to that for a pure safety I/O module from WAGO. 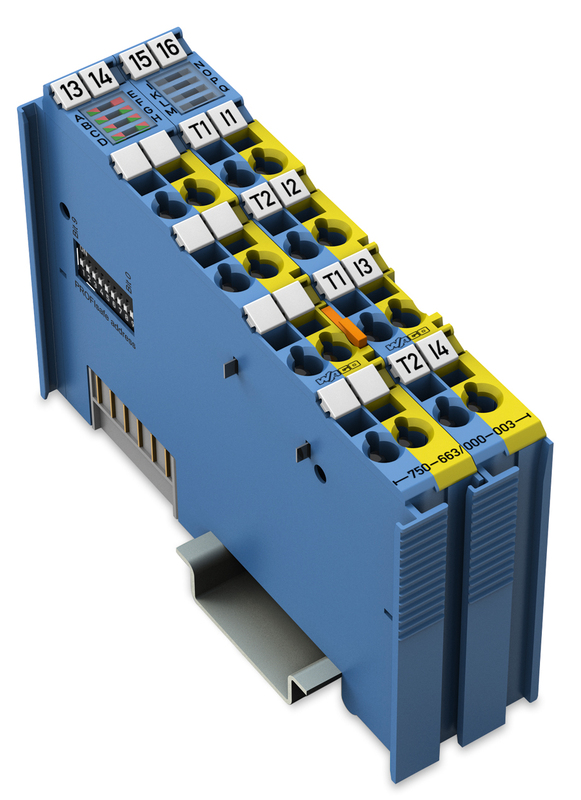 Approved for a wide variety of applications: with its fieldbus-independent design that features finely modular components, the WAGO-I/O-SYSTEM 750 readily meets all the requirements made of distributed fieldbus systems. The system’s modularity is also reflected in its support of numerous fieldbus systems. Depending on the application, it is possible to choose between fieldbus couplers and controllers (PLC) for different protocols. With 400+ digital, analog and specialty I/O modules, the WAGO-I/O-SYSTEM 750 offers scalable performance and high integration density with an unbeatable price/performance ratio.